Sharing the heart of God with the hearts of women. Pursuit is JoAnn Durgin’s latest book in the Lewis Legacy Series and is my favorite of all the books in the series. Pursuit stars Will Lewis, the next to the youngest child of the Lewis clan. As a toddler, Will was fascinated with outer space. As he grew older, he never wanted to be anything else but an astronaut and completely focused on, worked and studied towards that goal and he has finally made it. In just a few short months, he will command his own crew on a thirty-day mission to the International Space Station. Nothing will interfere with this, his ultimate goal. Nothing and no one will distract him. Enter Dalton Smith. The girl next door with the unusual name. Dalton is a Christian singer/songwriter who has gained popularity among Christian music-lovers. With her wit, charm, beauty, not to mention curiosity about NASA and the space program, she is just the distraction that Will does not need. But distract she does! It was so much fun to read how Dalton helped Will get his head out of the clouds and his feet back on the ground. 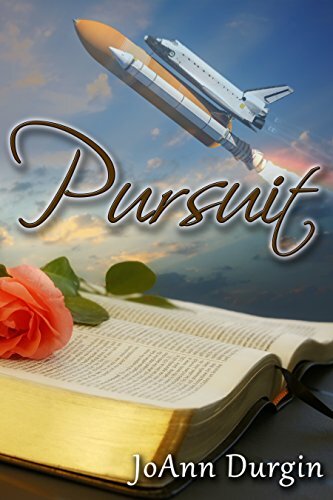 Ms. Durgin obviously did her research as Pursuit is filled with interesting facts about NASA and the space program, which in my opinion, made the book all the more captivating. In Pursuit, there is suspense, a beautiful love story, a reunion with the rest of the Lewis family (which is why I encourage you to read the other books in the series, although each book can be read on its own) and the Christian message that Ms. Durgin includes in each of her books. If I had to rate this book on a scale of 1-10, I’d give it a 15. It’s well-written, fun to read, and has a wonderful message.